Learning how to edit photos and create collages is important if you want to master digital scrapbooking or you simply want to impress friends and family with your artistic talents. There's no better way to show off your photo skills than to compile samples of your best work into stunning collages. The art of editing and creating unique collages from ordinary pictures has taken off in recent years, thanks in large part to advances in technology. [Microsoft Picture It Software|Photography software]] for home computers is not only readily accessible to amateur shutterbugs, but it's also very affordable. What's more, you don't have to be a computer whiz or a professional photographer to edit and assemble your favorite photos into works of art. All you need is time, patience and the ability to follow directions in order to transform your precious moments into photo masterpieces. Before you can begin crafting a photo collage, you need to locate the appropriate software. Fortunately, there are several reputable websites that allow you to access editing and collage-making software. In some cases the software is available for free. Others offer trials at no cost, but when the trial period is over you must pay to access the program for future photo projects. To avoid unwanted fees, remember to read the website's fine print before editing shots or creating collages. 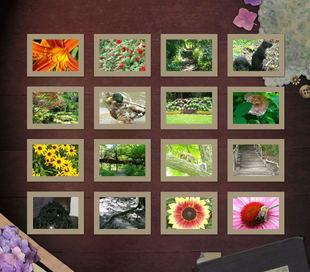 PictureCollagesSoftware.com is an excellent all-in-one photo collage program that caters to beginners. If you are a digital scrapbooking novice, this program will make learning how to edit photos and create collages a breeze. The highlight of this particular site is that it features hundreds of pre-designed scrapbook and photo collage templates. The program also allows you to create your own collages from scratch and offers simple step-by-step instructions on how to apply image frames, masks, drop shadows and other effects to your photos. When you're finished, you can save your edited photos and collages and export them back to Facebook, Photobucket, Webshots or any other photo-sharing site. Google's Picasa software download helps you organize, edit, and share your photos free of charge. However, some users don't realize that the program also allows you to create photo collages without paying a single cent. To create a personal photo collage, simply download and install the program. Picasa will automatically detect all images on your computer and create a library. All you need to do is view the pictures in the library, edit any photos you wish, and then add the selected images to your collage. The program gives you total artistic control over your collage content and layout. If you are pressed for time, you may also opt to create a collage from six different pre-made collage templates featured in the collage creation screen. Once you are satisfied with the arrangement of your photos, save your collage. You can share it with friends by uploading it to Picasa Web Albums, emailing, or printing it in high-resolution. Ifoxsoft.com is affectionately known as the "Lazy Photo Editor," because it makes editing photos and creating collages so easy. You can choose from dozens of pre-made templates or design your own collage. The site also features a handy interactive photo editor tool, which selects and removes unwanted objects from photos. Once the distracting item is removed, you can use the tool to compose a different background. The interactive photo editor works even if foreground and background colors are similar. When you are done cropping and altering your photos you can create a collage or apply other effects, such as clipart, text or drop shadows. Once the collage is complete, save it, print it, and then show off your photo treasure.